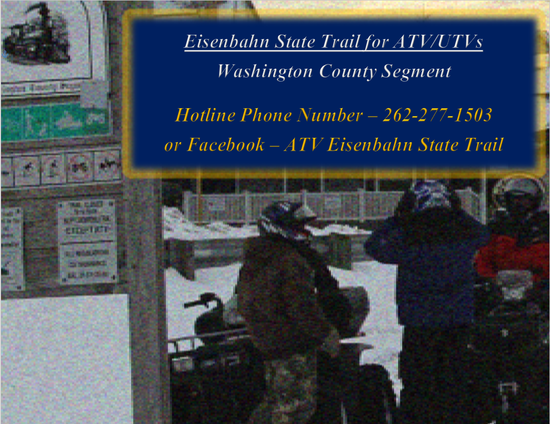 1-	The trail must be declared “OPEN” for ATV use here or on Facebook at "ATV Eisenbahn State Trail". Like / Follow that page and you will get notices to the opening and closings. You won't have to call in anymore if you check Facebook, however, if you don't have Facebook, you can call 262-277-1503. Pretty nice feature. The county snowmobile hotline is no longer the official	trail opening hotline for ATV/UTVs. 2-	The predicted high must be less than 29º for the entire day. Even if the hotline says it is open, if it is 29 or higher, stay off. 4-	25MPH throughout entire trail, 10MPH through towns. 2-	The lot next to Dimo's in the village of Eden. 1- All town ordinances apply. The Village of Kewaskum excludes ATV use from 2 am – 6 am. 2- All county parks rules apply except for hours of operation. 3-	ATV’s are limited and must stay on the straight 16 ft wide groomed trail. They must not trespass on any snowmobile trail, farm access road or road crossing leaving the trail.